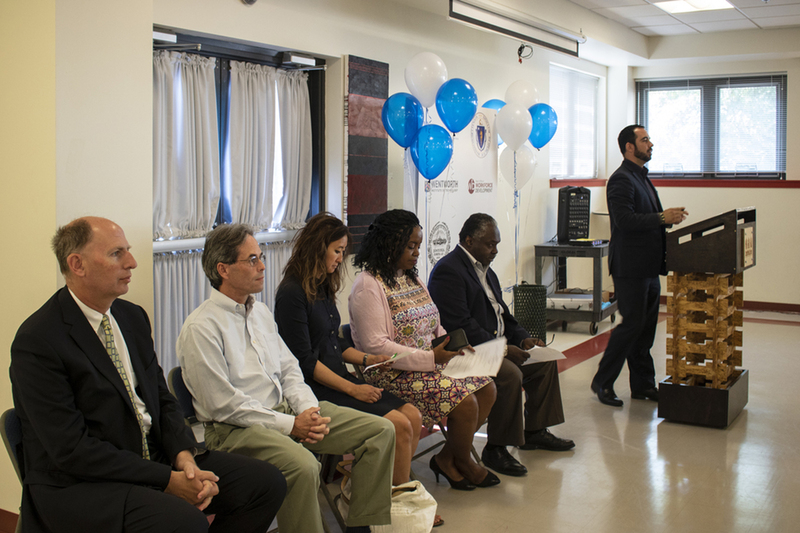 BOSTON, MA (July 17, 2018) The Mayor's Office of Workforce Development today joined community partners to launch the first registered apprenticeship for Facilities Maintenance Technicians in Massachusetts. The apprenticeship which develops skills in both indoor and outdoor facilities maintenance provides workers with pathways to college credit, as well as good pay, benefits, and career advancement with the program's employer sponsor, property manager WinnResidential. Apprenticeships offer valuable opportunities for our residents to gain experience that leads to good paying, quality jobs, said Mayor Martin J. Walsh. I thank WinnResidential, Wentworth, and YouthBuild Boston for their partnership on this important initiative that will help support our local economy. Through this new apprenticeship, residents who are interested in building and property maintenance can earn good money while they learn their new profession. For some, it may even be a gateway to a college degree, said Trinh Nguyen, director of the Mayor's Office of Workforce Development (OWD), which coordinated the apprenticeship's registration with the state. This is one of many career pathways we have developed to fulfill Mayor Walsh's vision of a Boston where residents have varied opportunities to build a career, support a family, and climb the economic ladder. This is a fantastic training and employment opportunity in a field with an increasing shortage of skilled workers locally and nationally, said WinnCompanies CEO Gilbert Winn. The apprenticeship program is a chance for men and women to pursue a well-paid, satisfying career that plays an important role in the quality of life for so many people. We're excited to partner with the City of Boston, YouthBuild Boston, and Wentworth Institute of Technology on this initiative. The Facilities Maintenance Technician apprenticeship is an 18-month, 3,000-hour program that consists of on-the-job learning with WinnResidential, as well as classroom instruction provided by WinnResidential and Wentworth Institute of Technology. Apprentices learn all aspects of facilities maintenance, including basic plumbing, electrical, and mechanical skills; cleaning and preventative maintenance; pest management; landscaping; and occupational health and safety. YouthBuild Boston, a job training organization traditionally focused on the building trades, is coordinating, managing, and overseeing program training and activities. Through their apprenticeship, participants are employed in full-time, year-round positions with WinnResidential, which manages more than 7,300 apartments in the City of Boston. Apprentices receive full benefits and earn starting wages of $16.50 per hour, which increase to $18.50 per hour by completion of the program. In addition to compensation and skills development, the apprenticeship also confers formal educational benefits. Apprentices earn a specially created Facilities Maintenance Technician Certificate upon completion of their Wentworth Institute of Technology courses. These courses are worth eight college credits that can be applied towards a Bachelor's degree in Facilities Management, if the apprentice chooses to continue their education. The Facilities Maintenance Technician apprenticeship is the latest in a number of apprenticeship opportunities OWD has facilitated across diverse industries. 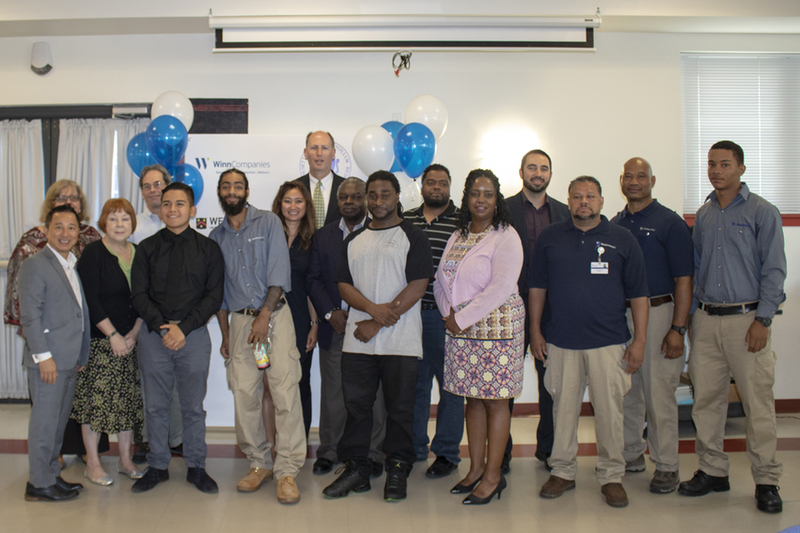 The Greater Boston American Apprenticeship Initiative a collaboration of OWD, local colleges, job training programs, and labor unions expands apprenticeship opportunities for Boston-area residents in construction and hospitality. This past spring, OWD also helped launch and register an Emergency Medical Technician apprenticeship with Boston EMS. OWD is an affiliate of the Boston Planning & Development Agency. Pictured the announcement are (left to right): William McKinney, Director of the Massachusetts Department of Labor Standards and Division of Apprentice Standards, Brian Kean, Executive Vice President of WinnResidential, Trinh Nguyen, Director Boston Mayor's Office of Workforce Development, Deborah D. Wright, Dean, College of Professional & Continuing Education at Wentworth Institute of Technology, Ken Smith, Executive Director of YouthBuild Boston and Michael Chavez, Project Development Manager for YouthBuild Boston. Our speakers pose with this year's new apprentices.